We have an unwritten rule in our kitchen that we try to have a meat free day once a week. We are not vegetarians so it takes extra creativity to come up with tasty ideas every week. This is one of them. Packs lot of flavour and is surprisingly filling. And most importantly it is fantastically easy to prepare. So if you are a vegetarian or just fancy an alternative to the usual protein based meal give it a go! Pre heat the oven to 200 centigrade. Heat the oil in a large frying pan over a medium heat and fry the garlic for about half a minute. 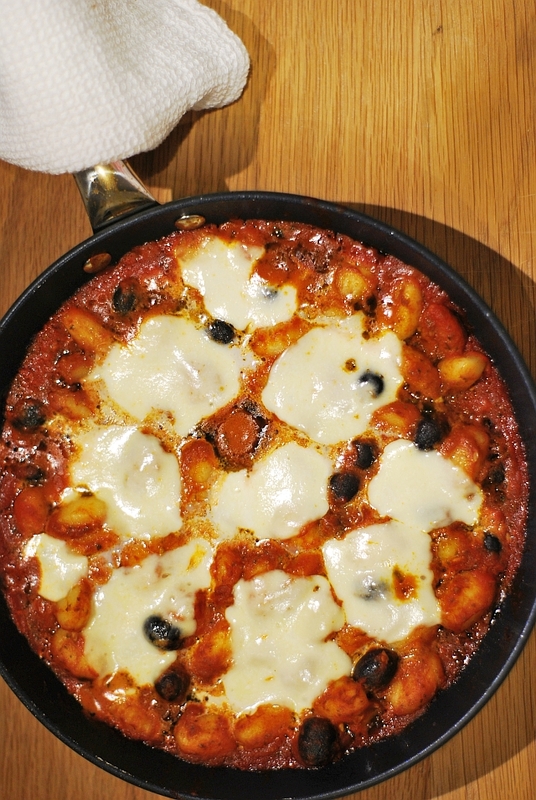 Pour in the passata, add olives and continue to cook for another 10 minutes stirring from time to time. Stir in the pesto, season to taste and remove from the heat. 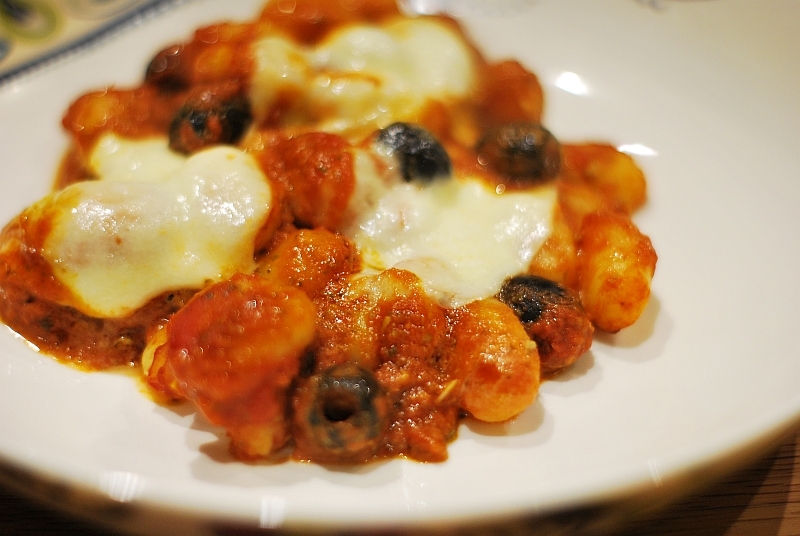 Cook the gnocchi in the boiling water until they start to float to the top. Drain and mix with the sauce in the frying pan. Transfer the mixture into a baking dish. 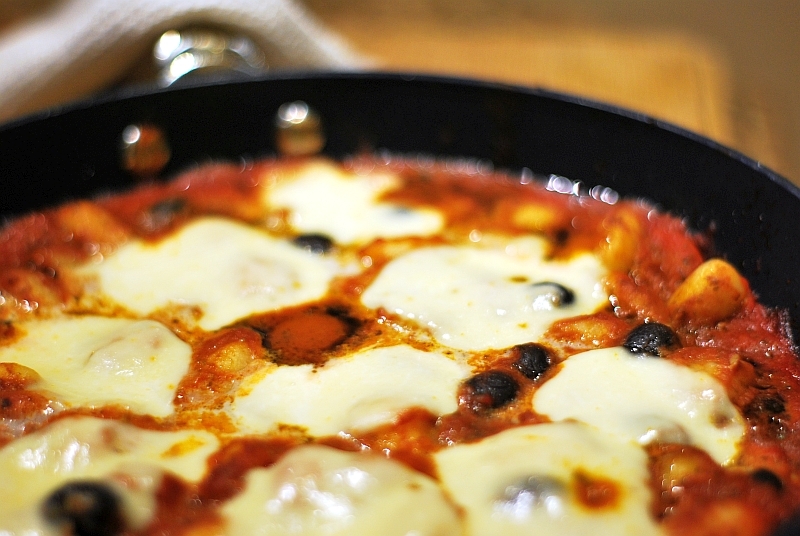 Scatter over the mozarella slices and place in the middle of pre heated oven for 10 minutes. Serve immediately in pre heated bowls with a glass of valpolicella.